A six-member rock band, having achieved fame and fortune, and having ‘danced’ with the ‘dark side’ and New Age, are starting to have second thoughts after undergoing trials and tribulations. 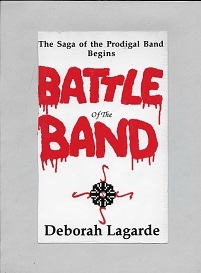 Battle of the Band is © Deborah Lagarde, 1996. Rights Reserved. Click here for the OmegaBooks Book Store! At this time, only cash, checks, and money orders will be accepted. I am working on getting set up with PayPal for e-checks. Please be patient! Book(s) will be shipped through the United States Post Office. See the Bookstore page for cost saving options by buying both books together. NO BULK ORDERS ALLOWED AT THIS TIME. NOTICE: If you are under the age of 21, please read the notice regarding book sales to anyone under the age of 21. If you are under the age of 21 and purchase ‘The Prophesied Band’ without parent or guardian permission, YOU, not OmegaBooks, is responsible if any written word in this book violates your belief systems or moral code or that of your parent of guardian. 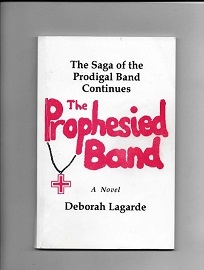 By buying any OmegaBooks from Deborah Lagarde or PayPal or any other third party platform, or downloading the FREE PDF e-book the Prodigal Band and sending me your address to mail you any of these books, you are sharing your name and contact information freely so that I can send you books or links to the FREE PDF e-book. Buying these books or downloading the FREE PDF e-book the Prodigal Band is proof of your knowledge regarding OmegaBooks’ compliance with the GDPR. A private 747 jet began its descent into Heathrow Airport from Waco, Texas. Six male passengers–members of the greatest rock band ever–sat aboard. Twenty minutes later, the plane landed. Through a white mist up a long spiral walked the men. High above, the soul-faces of teen music legends looked down at them biding their time to award judgment. And I, Counselor-angel to The Creator, watched the band ascend to meet their Maker. A lead singer with dark brown mid back-length hair accentuated by sensuous bangs on a baby-face was slender, thin-lipped and of medium height. Voice a Godly gift–yet, some said, the devil’s tool. The tall, dirty-haired guitarist possessed an angular face and had hair growing on once-shaved sides of his head. Now without the screaming instrument he fired into immortality. The dark, strapping bass player with Adonis black curls and eyes as black as Tyne Valley coal walked without his trademark gold chains. The tall, lanky, beak-nosed, ringlet-haired master of many guitars worried over his past perversions. The pot bellied, bikeresque synthesizer player famed for red hair wild as the wind, fiery as his brew, bore a downcast of regret. The Beforetime. The Creator. Sons of The Creator. The dark. When Corion, His ill-begotten son, used his serpent fire to make off with the Light, his Father banished him. A gold chain from which hung a red crystal beacon was flung around Corion’s neck. Livin’ fast and full they forgot one rule. Corion never escaped the Abyss. He grew in strength and prospered there, the world below unknowing of his Evil. Until one day in 50 A.D. when Crynnwagg, High Priest of the Celtic Crag-Dwellers of Wales, came back from the dead, his blood having been drained by Druid priests. Crynnwagg brought back from the Abyss Corion’s legacies. And with the red crystal, the Crag-Dwellers dealt retribution on the Druids. They tied fourteen children to fourteen trees and burned them. In the unification of Norman-ruled Britain in the eleventh and twelfth centuries, the First Duke of Effingchester stole Crynnwagg’s treasures–and with it, the power to summon The Evil. Within his bed chamber, the Fourth Duke of Effingchester knelt before a stone altar. A pagan cross radiating from a sun-circle encasing a snake had been carved on it. He put his red crystal medallion around his wrinkled neck and called forth The Creator’s outcast son, a god of darkness born in light. As The Demons crossed the dimensional barrier headed for Walltown to wreak havoc on the poor Hovels dwellers, The Creator called upon The Tooters. “How will we defeat The Demons, Our Creator?” Tooter Two, a mere child amongst its elders, asked. Into the fire The Demons cast the Hovels. The Duke and the English king divided the spoils so that the Duke owned most of the land and its people. An old witch protected and gifted by The Tooters with supernatural vision and hearing listened to The Demons vocalize the final verse of their Song over the smokey pall around her. By all the wicked spirited. The witch of the Hovels turned her head upward when The Tooters spoke to her.